Burgums lived here, or nearby. HEREFORD ST MARTIN'S in Hereford was built in 1845, replacing another church of the same name elsewhere in the city. It is on the Ross Road. It is cruciform in shape, with tower and lofty spire. It is located close to the old SAS base and has close links with 22 SAS Regiement. At the rear of the church is the final resting place of some of the member of the Regiment. Inside the church are a number of notable glass windows and, in particular, a memorial window to the SAS Regiment. There was also a tent erected in the grounds, which was most tastefully laid out, in which upwards of 60 poor men and women, all of about 60 years, principally cottagers, tenants, and neighbours of Mrs. Powell, were sumptuously regaled with substantial eatables and good cheer. The afternoon was a delightful one, and considering the beauty of the scene on and around these grounds, everybody must have spent a most agreeable evening. The school-children and others, to the number of 200, were treated with an abundance of plum cake and other refreshments in the school-room, which was tastefully fitted up, by the kindness of the ladies of the neighbourhood. HEREFORD ST PETER'S appears to have been built about 1070 by Walter de Lacy dated by a carved stone discovered in 2011. The current church was built in the late 13th century and the early 14th century. 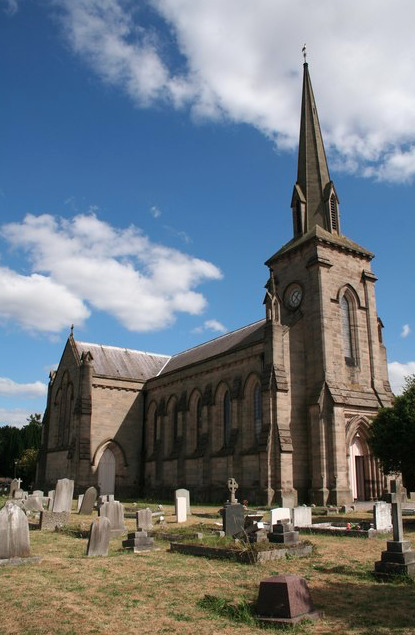 It has a nave with north and south aisles and a chancel with a south chapel (The Lady Chapel) and a tower and spire. Restoration of the church took place in 1727, which included extra seating. It received a further restoration in about 1885. HEREFORD ST OWEN'S is interesting because no longer exists! 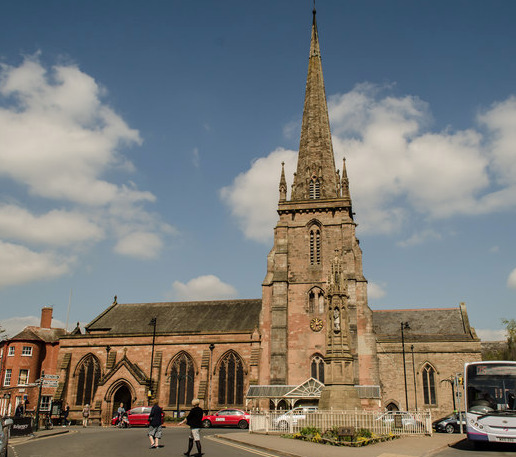 The parish church of St Owen, in Hereford was built some time before 1626, but its' demise came during the English Civil War (1642-1651) when the city of Herford changed hands four times. The church was destroyed andiIt was never rebuilt. St Martin's church, as stated above, was rebuilt and later replaced another church of that name on a different site. The parish church of St Owen was situated "without St Owen's gate", one of the 6 gates used to enter the city of Hereford: they were removed between 1782 and 1798. The church site was later occupied by St James's Infant School. There was also a large graveyard, on the opposite side of St Owen's Street, stretching down as far as Daws Road. On a map of 1904 the graveyard was marked as "Disused", but by 1967 it had been cleared and its site occupied by housing. Benjamin Burgum 12 Jan 1813 Hereford St Owen Burial age 5w. Elizabeth Burgham 07 Sep 1817 Hereford St Owen Burial age 1y+. Elizabeth Burgham 20 Apr 1819 Hereford St Owen Burial age 16y.